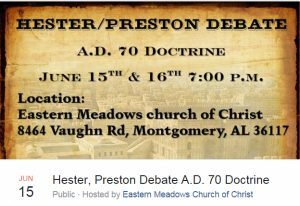 The Eastern Meadows congregation invites you to a debate between our very own David W. Hester (Faulkner University) and Don K. Preston of Ardmore, OK concerning the A.D. 70 doctrine. 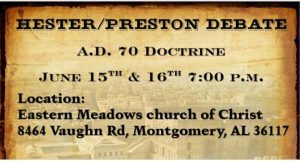 This event will be held June 15th and 16th at The Eastern Meadows church of Christ located at 8464 Vaughn Rd. Montgomery, AL 36117. Resolved: The Bible teaches that the Second (final) coming of Christ and the attendant resurrection of the just and the unjust, is yet future, and will occur at the end of time.